When I visited Central Park earlier this year with our guests from out-of-town I could not help but to image this incredible space as an edifice. Architects have always been fascinated with towers and skyscrapers. Can we apply some of the theories of Fredrick Olmsted to a skyscraper in the city? Could this be the beginning of the resurgence of the city? Click here for more Architectural theory and concepts. 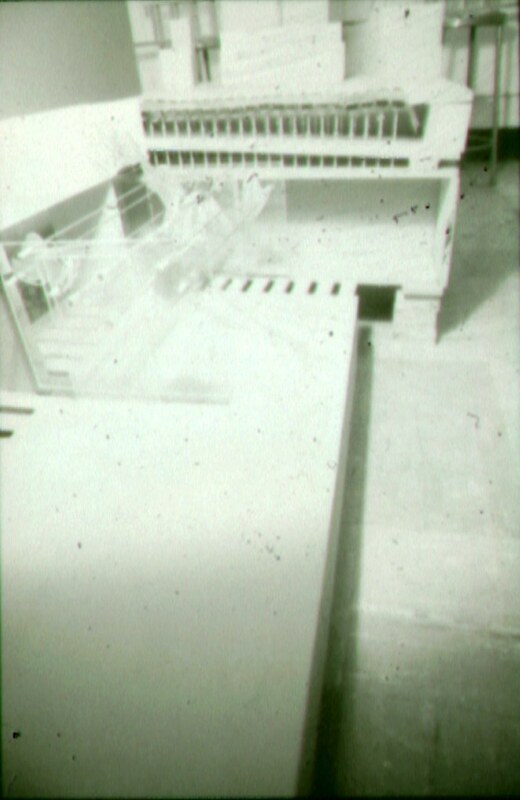 Oscar Ribeiro de Almeida Niemeyer Soares Filho is considered to be a pioneer in creating new possibilities for using the reinforced concrete just for aesthetical reasons. He started with designing the first state-sponsored skyscraper in the world, for the Brazilian government. It was completed in 1943 and after decades it was recognized as the first example of Brazilian modernism. He was part of the international team that designed the UN headquarters in New York and his conceptual plan was the main source of inspiration for the constructors. His membership in the Brazilian Communist Party limited his chances of working in the United States and got him exiled up until 1985. By the time the exile ended, he designed the main administration buildings in Brasilia, the country’s new capital city. While in Europe, he created several buildings, including the headquarters of the French Communist Party and the Mondadori Publishing House office near Milan. After returning to his home-country, Niemeyer continued to design impressive structures around Brazil such as: Niterói Contemporary Art Museum, the Catedral Militar Igreja de N. S. da Paz, the Memorial dos Povos Indigenas and many others. At his age (103), he continues to work at his office in Rio de Janiero. I recently read an article on this artist and could not wait to share him with you. Recently put on display at the David Zwirner gallery in New York, Japanese Artist Yataka Sone used photographic reproductions, imagery from Google Earth, and several helicopter rides to painstaking recreate Manhattan in marble. Every detail (Central Park, skyscrapers, streets, avenues, and the bridges to the east and west) was recreated to scale. Read the article here. My favorite NYC building; The Chrysler Building is an Art Deco skyscraper in New York City, located on the east side of Manhattan in the Turtle Bay area at the intersection of 42nd Street and Lexington Avenue. Standing at 319 meters (1,047 ft), it was the world’s tallest building for 11 months before it was surpassed by the Empire State Building in 1931. After the destruction of the World Trade Center, it was again the second-tallest building in New York City until December 2007, when the spirewas raised on the 365.8-meter (1,200 ft) Bank of America Tower, pushing the Chrysler Building into third position. In addition, The New York Times Building, which opened in 2007, is exactly level with the Chrysler Building in height. The Chrysler Building is a classic example of Art Deco architecture and considered by many contemporary architects to be one of the finest buildings in New York City. In 2007, it was ranked ninth on the List of America’s Favorite Architecture by the American Institute of Architects. It was the headquarters of the Chrysler Corporation from 1930 until the mid-1950s, but, although the building was built and designed specifically for the car manufacturer, the corporation did not pay for the construction of it and never owned it, as Walter P. Chrysler decided to pay for it himself, so that his children could inherit it. One World Trade Center (1 World Trade Center), more simply known as 1 WTC and formerly known as the Freedom Tower, is the lead building of the new World Trade Center complex in Lower Manhattan in New York City. The tower will be located in the northwest corner of the World Trade Center site, and will occupy the location where the original 8-story 6 World Trade Center once stood. The north side of the tower runs between the intersection of Vesey and West streets on the northwest and the intersection of Vesey and Washington streets on the northeast, with the site of the original North Tower/1 WTC offset to the southeast. Construction on below-ground utility relocations, footings, and foundations for the building began on April 27, 2006. On March 30, 2009, the Port Authority confirmed that the building will be known by its legal name of ‘One World Trade Center’, rather than the colloquial name ‘Freedom Tower’. Upon completion, One World Trade Center will be the tallest building in the United States, standing at a height of 1,776 feet (541.3 m), and among the tallest buildings in the world. It will be completed by the end of 2013. Along with One World Trade Center, the new World Trade Center site will feature three other high-rise office buildings along Greenwich Street and the National September 11 Memorial & Museum. The construction is part of an effort to memorialize and rebuild after the original World Trade Center complex was destroyed during the terrorist attacks of September 11, 2001. Upon completion, One World Trade Center will become the tallest all-office building in the world. The following photo by Frank Cunha III was taken from the Empire State Building. This article was written by Jonathan Glancey and published on guardian.co.uk on Tuesday 5 July 2011. A version appeared on p19 of the G2 section of the Guardian onWednesday 6 July 2011. 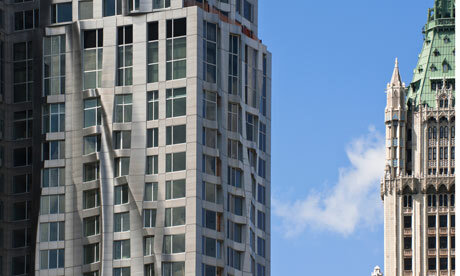 It’s Frank Gehry’s first skyscraper – a twisting, rippling tower that is transforming the New York skyline. Jonathan Glancey talks to the 82-year-old architect about realising a lifelong ambition. What Gehry, evergreen at 82, has been building up there on the site of a former parking lot on the border of New York’s financial district, close by Brooklyn Bridge, is an $875m (£543.3m), 870ft, 76-storey residential tower, clad in heroic, sculpted folds of stainless steel. It houses 903 rental apartments – none are for sale – with prices ranging upwards of $2,630 a month, and is due for completion in five months’ time – although the builders who show me around say that some 200 flats have already been let. The Empire State Building is a 102-story landmark Art Deco skyscraper in New York City at the intersection of Fifth Avenue and West 34th Street. Its name is derived from the nickname for the state of New York, The Empire State. It stood as the world’s tallest building for more than forty years, from its completion in 1931 until construction of the World Trade Center‘s North Tower was completed in 1972. Following the destruction of the World Trade Center in 2001, the Empire State Building once again became the tallest building in New York City and New York State. New York City, The Empire State.